Steven (Chicagoland, United States) on 16 February 2017 in Architecture and Portfolio. From the Archives... This must have been a photo I overlooked when I felt I was posting too many interior shots of Holy Name Cathedral all within a few days back in 2010. Thankfully, it was not deleted. 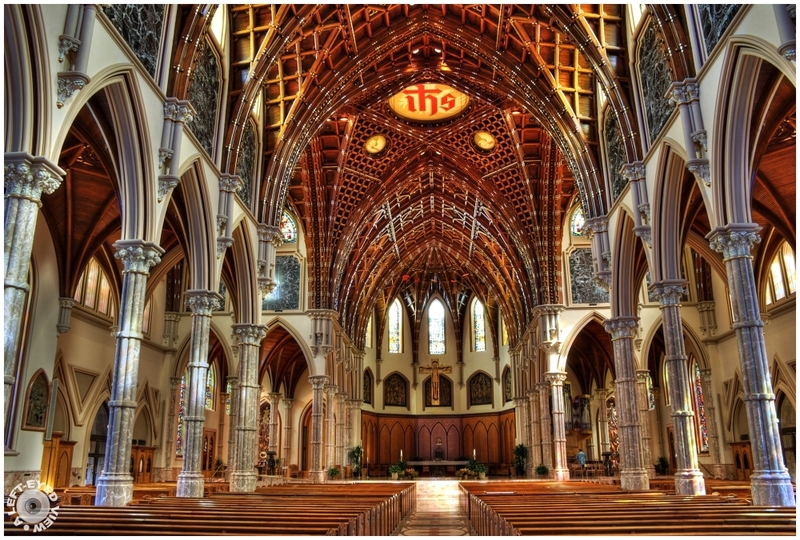 This is a view looking toward the altar of Holy Name Cathedral in Chicago, Illinois. This was my first time in Holy Name Cathedral (back in 2010) after reading a Flickr member's post about how accommodating the Cathedral was to allow photographers in. This cathedral suffered severe roof damage when it caught fire in early 2009. What a beautiful job in the restoration. Superb light and stunning detail - good to know you have re-discovered this image. C'est magnifique avec ces belles couleurs et la lumière. Wow !! It's magnificent! Absolutely ! Spectacular cathedral. Good restoration. And great photography. Indeed, thankfully, it was not deleted ! A most attractive mix of styles and materials and colours and shapes! I'm glad this wasn't destroyed by the fire. Your look down the aisle is superb as it takes in so much of what there must be to see! Very impressive and, yes, the repair-restoration is remarkable. I see from Wiki that there was bravery, dedication and good-fortune in containing that fire. Tremendously nuanced and deft HDR work here, Steven. The detail and light are magnificent, as is the interior itself of course! wow...what a magnificent image here ! A very attractive interior shot of this cathedral. A gorgeous image of this fantastic interior. You've taken in quite a wide area with this photo.... so much to see! It definitely would have been a shame if it had been destroyed by the fire. The architecture is outstanding.... I grew up going to a small country church so I am always flabbergasted when I see one such as this. An excellent view... wonderful clarity and detail! A gorgeous cathedral! It is just beautiful! I love the columns and arches. I am so glad that it was restored after the fire. That is nice. The HDR really brings out the details. Amazing shot! It's so beautiful! Fantastique intérieur et rendu sur les bancs quelle vue sueprbe. Very nice shot ! Nice details. This is a gorgeous shot of this spectacular interior of the cathedral. I'm glad they let photographers take pictures. It's a beautiful cathedral. The ceiling is magnificent. Thankfully he was recovered after the fire. This is a gift for the eye. Wonderful. such beautiful composition, perspective, colors, lights & details! Magnifique mise en lumière, compliments ! Magnifique architecture ! Excellent cadrage !